You must have missed the dog movie with Jennifer Saunders' daughter part of the tweet. BID0 wrote: You must have missed the dog movie with Jennifer Saunders' daughter part of the tweet. How did I forget that? This generations Citizen Kane I expect. I assume they’re working on data they have on cinema attendance in the U.K. during the World Cup but delaying a whole month seems abit much. There’s not even that many matches left from the USA release date, just QFs onwards I think. Tomous wrote: I assume they’re working on data they have on cinema attendance in the U.K. during the World Cup but delaying a whole month seems abit much. There’s not even that many matches left from the USA release date, just QFs onwards I think. Cup though they would surely just put it back a couple of weeks as the original release date is when the QF’s start so the tournament is virtually over at that point. Maybe they are hoping that the British summer holidays will give a boost to the film. A lot of summer releases are based around US school summer holidays that start a lot earlier than the UK ones, normally early June. Ant Man trailer was a bit meh. I guess it'll be amusing enough, but I definitely won't be going to the cinema to see it. Preezy wrote: Ant Man trailer was a bit meh. I guess it'll be amusing enough, but I definitely won't be going to the cinema to see it. Not arsed about Ant-Man getting delayed. Skipped the first one when it was out in cinemas and was probably going to do the same again anyway. He's called Ant-Man and she's called The Wasp, but ants are actually specialised wasps so technically the film and character should just be called The Wasp. Marvel send me money please. Some characters don't need solo movies- Black Widow is one of them. Memento Mori wrote: Some characters don't need solo movies- Black Widow is one of them. Scott Lang Ant-Man got one, so anything is fair game now. Although I don't necessarily disagree with you, the same could definitely have been said for relatively unknown-in-pop-culture heroes such as Ant Man and, yup, Black Panther. Not Black Panther. There's a lot of great Black Panther source material to draw on. Black Panther has a lot of historical significance and is quite well-known in pop culture since he was the first ever black superhero and is still probably the most prominent one along with Storm. He absolutely deserved a film. It was a hypothetical, for sure, but yes, a bad one. Perhaps Thor would have been a better example. Thor is more known than Black Widow and Black Panther to the casual fans, surely? Any excuse to see more of Scarlett in that outfit is fine by me. Now rumoured to be joining Spider-Man 2, Black Panther 2, Guardians 3 and Black Widow is... THE ETERNALS. Matthew and Ryan Firpo, whose spec script 'Ruin' shot to the top of the 2017 Black List, have been hired to adapt the Jack Kirby-created comic book. 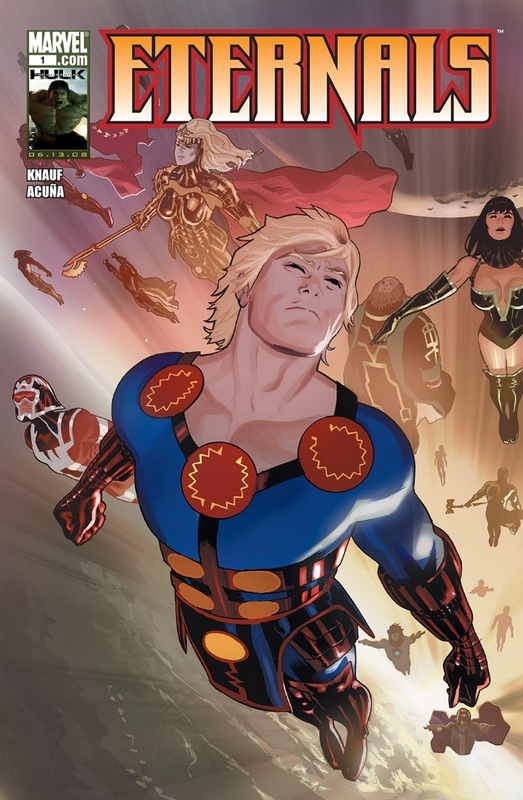 Marvel Studios has pinned its next potential franchise, the Jack Kirby-created title The Eternals, and is moving ahead with development. The studio behind Avengers: Infinity War has hired writers Matthew and Ryan Firpo, whose spec script Ruin shot to the top of the 2017 Black List, to pen the script for the superhero team adventure. In comics lore, the saga of the Eternals began millions of years ago when the cosmic beings known as the Celestials genetically experimented on humans, creating the super-powered and near-immortal beings and a more monstrous off-shoot known as the Deviants. The two races moved behind the scenes throughout human history while also engaging in Game of Thrones-style cosmic powerplays. Among the characters are Ikaris, fueled by cosmic energy; Sersi, who relishes moving amongst humans; and Thena, often mistaken for the Greek goddess Athena. Seems they were hinted at in Guardians and Infinity War and they could fill the Inhumans hole left by the award winning TV show. Phase 4 is going to be space heavy... I'm not sure I'm interested in that so much. We're definitely starting to get into more characters that I'm not very familiar with. Never read the Eternals and could tell you nothing about them. It's a problem Marvel will face now that the longstanding MCU characters are probably going to start either leaving/dying or becoming more background characters. With FF4 and X-Men coming back though they definitely have some high-profile characters they can turn to. I'm confident in whatever they put out though. Feige hasn't put a step wrong yet and I will admit I didn't know much about the Guardians before they announced that movie. The future is interesting to be sure.